Page one of letter dated January 19, 1864 and the letter dated February 1, 1864. 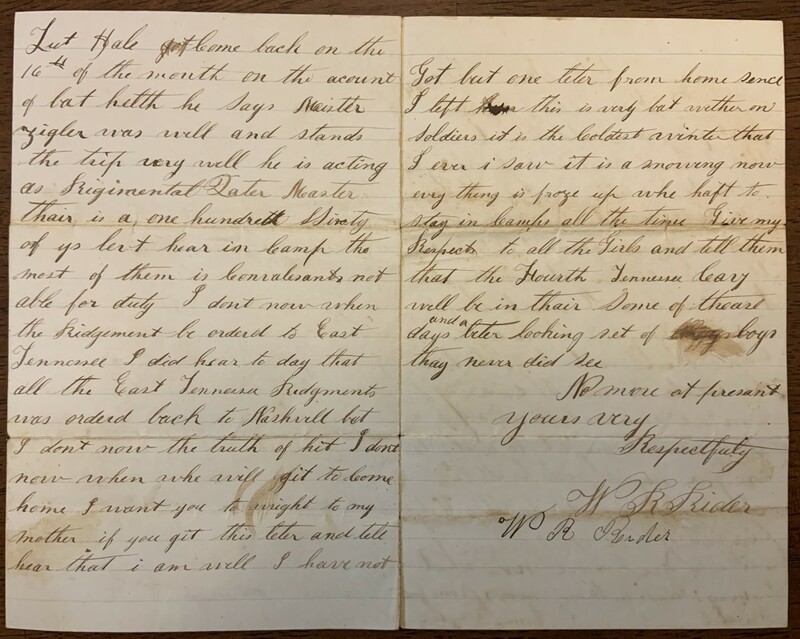 I recently purchased a collection of Civil War era letters at a collectible show. The dealer told me he acquired the letters at an estate auction. Nearly all of the letters he had for sale were from the Ziegler family of Pennsylvania and dated from the 1860s to the 1880s. The letters were hard to read due to the cursive writing style, lack of punctuation, misspelled words, and poor grammar. To make sense of the letters, I have transcribed them letter by letter. From these two letters and some of the other letters I purchased, I was able to figure out, with a little detective work, the stories the letters had to tell of the people and events of that time. 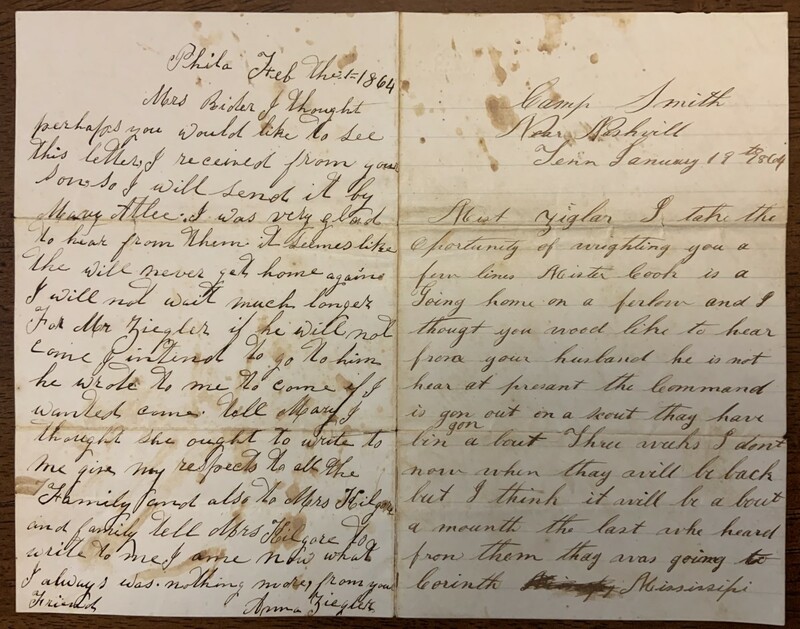 The first letter, dated January 19, 1864, is from a Union soldier, W.R. Rider, stationed at Camp Smith at Nashville, Tennessee. He wrote to a family friend, Mrs. Anna Ziegler, to tell her of her husband’s wellbeing. He also requested that Mrs. Ziegler forward his letter to his mother in Philadelphia so she would know he was well. Mr. Rider was stationed at Camp Smith, which was commanded by the federal Major General Andrew Jackson Smith. Page two of letter dated January 19, 1864. The second letter is from Anna Ziegler to Mrs. Rider, the mother of the soldier who wrote to her in the first letter. Her spelling is better than Mr. Rider’s is in his letter, and she does use some punctuation. Mrs. Ziegler tells Mrs. Rider that she plans to go see her husband if he doesn’t come home soon. This sounds like a dangerous trip. To travel from Philadelphia to Nashville in 1864 during the midst of the Civil War would be a challenge as many of the railroad, river, and ocean modes of transportation had been interrupted by the war—not to mention, there were many active rebel soldiers all over that part of the country. 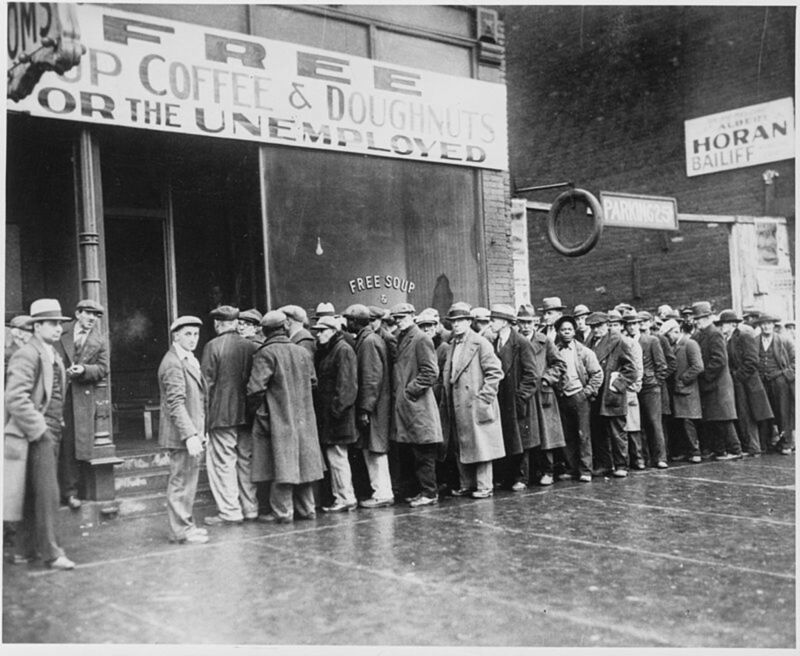 They truly lived in perilous times. Stationed at Nashville, Mr. Rider and Mr. Ziegler would probably have been involved in the major battle at Nashville that occurred in mid-December 1864. The Union forces had gained control of Nashville in February 1862 and had constructed extensive fortifications around the city. By 1864, the Union defensive line consisted of a seven-mile semi-circular line studded with forts, the largest being Fort Negley. The Cumberland River formed a natural defensive blockade to the east and north of the city. 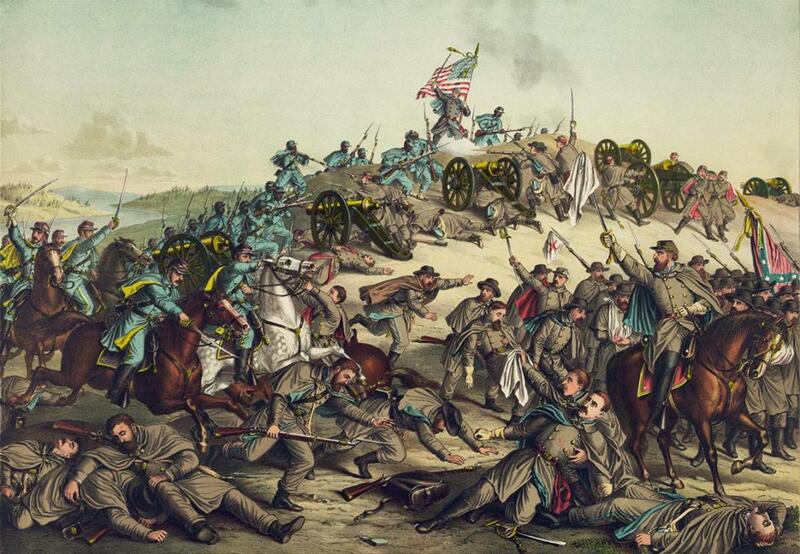 The two day Battle of Nashville took place on December 15 and 16 of 1864. The much larger federalist forces were led by General George H. Thomas, who fought against the Confederate forces of General John B. Hood. On the first day of the battle, the Confederates were pushed back. On the next day, while holding his left wing, Thomas pressed forward on his right and drove the Confederates in a hurried retreat from the battlefield. While the Union forces lost over three thousand men during the battle, the Confederate army suffered a much larger causality rate with over six-thousand dead of their twenty-three thousand troops. Thomas’s victory freed Tennessee of organized Confederate forces and ended Hood’s Tennessee campaign. The Union commander Andrew Jackson Smith was born in Bucks County, Pennsylvania, in 1815. 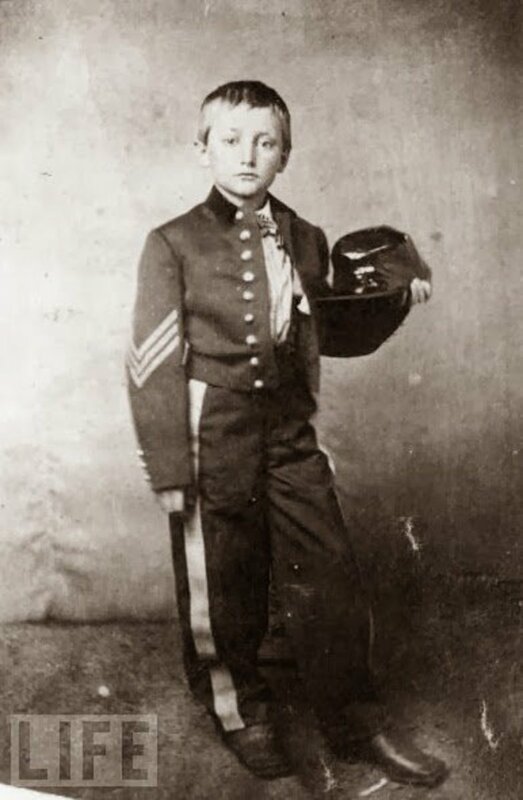 He graduated from the Unites States Military Academy in 1839. Leading up to the Civil War, he served on the frontier, in the Mexican War, and in the Indian Wars. By the time the Civil War started, he had been promoted to the rank of colonel. 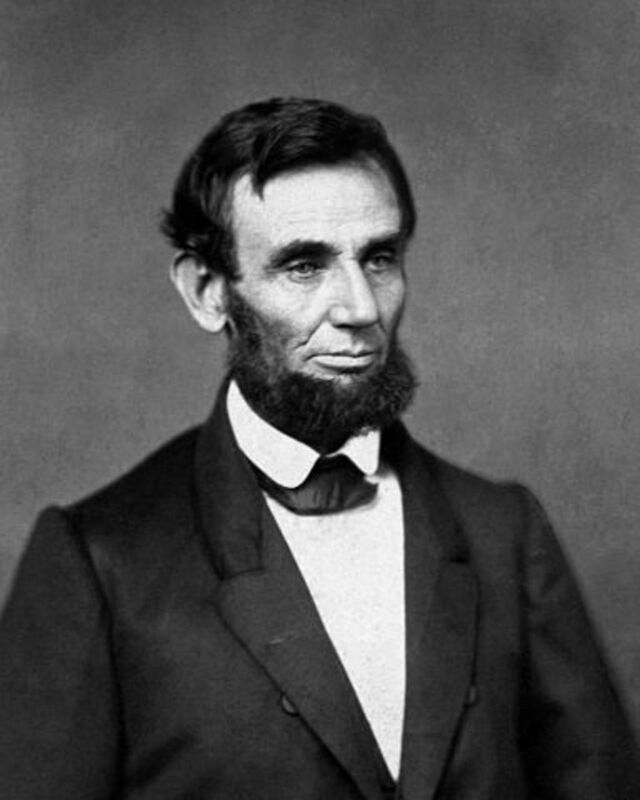 In May 1864, President Abraham Lincoln appointed him a major general. 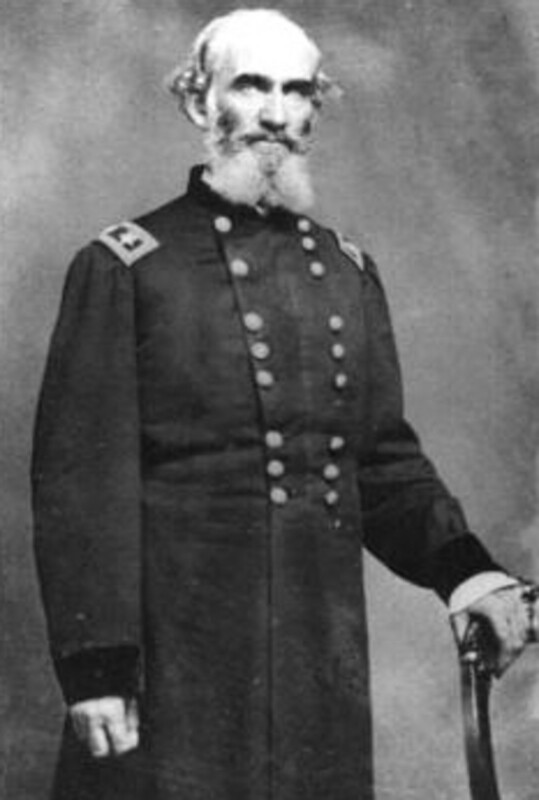 In the fall of 1864, Smith joined forces with Major General George Henry Thomas at Nashville, Tennessee. Smith led his troops to a decisive victory over the Confederate troops, commanded by Lieutenant General John Bell Hood, in the two day battle in mid-December 1864. After the Civil War, Smith remained in the army until retirement in 1869. He then became the postmaster of St Louis, Missouri, where he died in 1897. Major General Andrew Jackson Smith. From another letter in the collection I learned that Mr. Ziegler was actually Joseph Ziegler. I searched through ancestry.com and found that fifteen Joseph Zieglers were in the Civil War and four were from Pennsylvania. Without knowing which unit he was assigned to, it was impossible to determine which of the four Joseph Zieglers was referenced in the letters. I had more luck with finding out about Mr. Rider since in the letter he states he is with the Tennessee Fourth Cavalry. I found out that his full name was William R. Rider and he was born in Wythe County, Virginia, in about 1837. He enlisted in the Union army on December 20, 1862, as a private and was promoted to Regimental Commissary Sergeant on April 20, 1865. 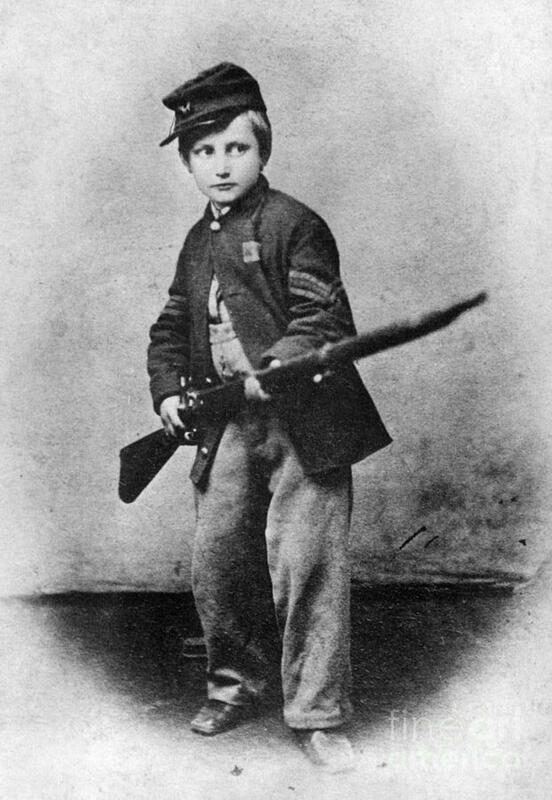 Since the Civil War officially ended on April 9, 1865, he survived the war. The letters gave me the chance to see, however briefly, a firsthand glimpse into the lives of two families during the nation’s bloodiest conflict. Most of my exposure to history has been through books and museums, so it was a real treat to hold history in my hands. When reading an old letter from a long-forgotten time, it makes you wonder about the state of mind of the author and the reader. Was Mr. Rider telling all or just enough to make Mrs. Ziegler and his mother content? Was Mrs. Ziegler really going to travel to the South from Philadelphia during the Civil War? The answers to these questions and countless others are lost to history. Boatner, Mark Mayo III. The Civil War Dictionary. Revised Edition. Vintage Books. 1988. Holzer, Harold and Craig L. Symonds. The New York Times Complete Civil War 1861-1865. Black Dog & Leventhal Publishers. 2010. Campi, James Jr. Civil War Battlefields Then & Now. Thunder Bay Press. 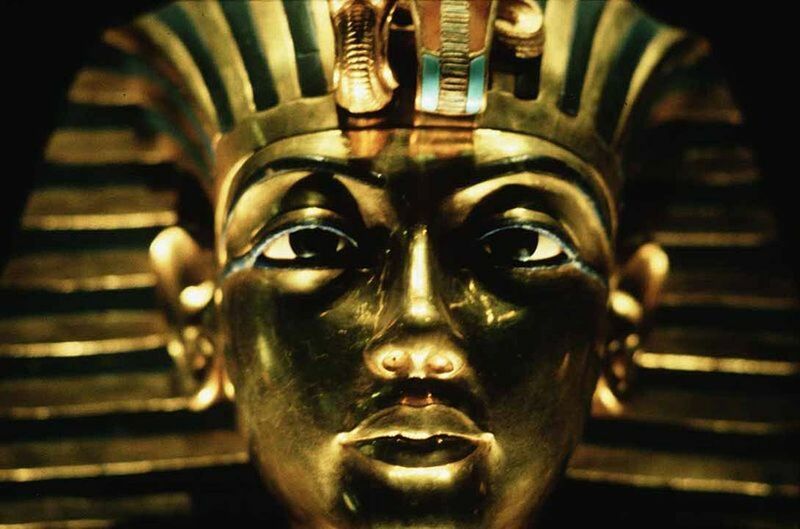 2012.
www.ancestry.com Accessed March 28, 2019. Thanks. I found the letters very interesting, even if they were a little hard to read. I wish that I could have afforded to buy more of the letters from the dealer. I have a couple more of the Ziegler family letters from the collection. I may get busy on and try to decipher the additional letters. I am sure there is another story in one of them. Excellent article. I had a neighbor who told me they left their aunt live in their house when they went to Europe for a year. When they came back. they discovered she had cleaned their house from top to bottom. This included throwing out their great, great grandfather's letters he wrote to the family during the Civil War as well as his officer's sword and uniform. She told the family they didn't need that old stuff. They were heart broken. So, I'm glad to hear those letters. They certainly wrote differently back then. Enjoyed reading this.